It’s a fairly common question and one that I hear regularly from beer drinkers. Where packaging design will influence a purchasing decision at a retail store, a beer’s name heavily influences purchasing decisions at a bar, restaurant or tasting room. We as an industry seem to have exhausted almost all hop puns and, for the most part, offensive beer names have been relegated to the gutter from whence they came. Some breweries have chosen the simplistic approach of just calling the beer by its style name. Others have chosen to name the same beer after every NFL team or state that houses one of their breweries. For us, beer names have always been attached to a story. A couple of our beer names in particular are the inspiration for this post. If you’re bored enough to continue reading, hopefully you’ll be inspired to drink them. The beer names I’m referencing here are Haze County Double IPA and our Dispensary Series™. I’ve chosen these two beers for a couple reasons. 1) We are releasing or have just released these beers in cans. 2) We’ve had a very interesting back and forth with the TTB as we attempted to get them federally label approved. We’ve been working for some time to execute a double IPA that we were all happy with. We’ve gone through multiple iterations over the years with some modicum of success. Contrary to popular belief, it’s not as easy as just throwing in double the malt and double the hops (cue up the Doublemint commercials of the 90’s). There are many factors at play that must be addressed with finesse and tact. Most importantly is yeast health during fermentation. Coaxing your yeast into chewing through a Wonkaland of fermentable sugars isn’t the easiest thing in the world. When not taken care of, it can ruin an otherwise tasty double IPA. The other side of the equation is balancing the copious amount of hops generally used with the higher alcohol presence all the while being able to yield enough finished beer to make it financially viable. Generally with a hop load this large, a sustainable haze will be present in the beer. As of late, breweries have taken this hazy beer craze in many different directions, some with fantastic results and others, well, not so fantastic. 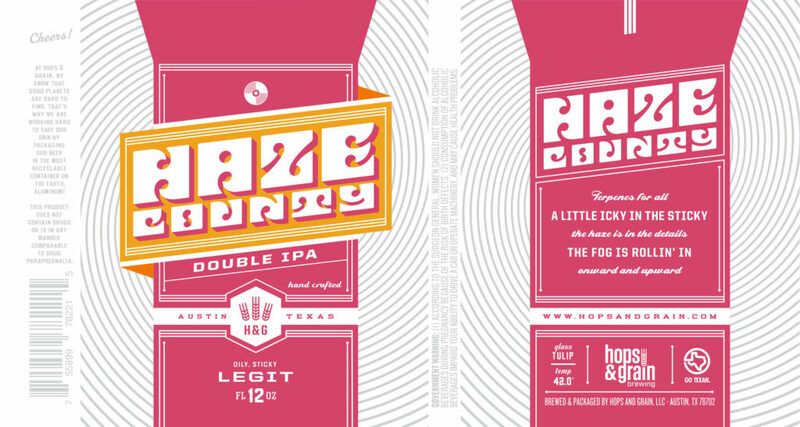 The Haze part of the Haze County name is partly related to the hop haze that is present in the beer, even after centrifugation. The other component of the Haze County name is a “tip o’ the hat” to our second brewery down in San Marcos, located in the southeastern corner of Hays County. Seems innocent enough on paper, but where the TTB enters into this story is not so jovial. Turns out some of the language that we used on the original can design was a bit too descriptive for the powers that be. They felt that our references to the words “sticky” and “oily” may lead people to believe that we were making a reference to marijuana. The can design in its original form seemed to be fine with the TABC, but when we tried to receive label approval for shipping it outside of Texas, we got rejected. In the great state of Texas, breweries are not required to seek federal approval if the beer is only sold in Texas. Now you’re probably thinking the same thing that I was thinking — Texas approved this but the Feds didn’t? Yeah, and even more ironic is that we were seeking federal label approval so that we could ship the beer to Colorado. After 2 weeks of back and forth with the TTB, we finally acquiesced and removed the words in question. Below are the original and the final labels for your enjoyment. While I never intended for this to be part of the story behind the name, it definitely adds a bit more depth to the storyline. My favorite addition to this label is the disclaimer on the left side above the UPC code. First, a bit of clarification. Yes, that is indeed a Trademark symbol next to the name. Yes, we do indeed have federal trademark approval for Dispensary Series in the beer category. Yes, it was indeed a career highlight for me. The Dispensary Series™ came to life a couple years ago as a possible solution to the rotating tap handle craze. We love the “rotation nation” as much as anyone because it provides all of us as beer drinkers with variety. As a brewery, though, it presents a few challenges, especially as your batch sizes begin to increase. We dabble in a healthy amount of experimentation at the brewery, and we love to offer our retail accounts a lot of options. But, in this lovely three-tier system that we operate in, it sometimes becomes too difficult to always have something new to offer our customers, especially with a wholesaler in the middle. Between our 6 year-round beers, Greenhouse IPA, and our seasonal releases, it’s all that we can do to keep these beers available. But, inevitably, the question “do you have anything new” pops up regularly. Some time ago, dispensaries were known not as a place where you go to buy weed in the few states that allow it, but rather more like a pharmacy. In the nineteenth century, dispensaries were ultimately walk-in clinics for those that could not afford private medical attention — a place that could “cure what ails you.” Our cure for the rotating tap handle was the Dispensary Series™. This series consists of 6 different beers, all expressively hoppy and always available. A single dispensary tap handle could rotate through 6 different beers without ever having to rotate the handle itself. In some romantic sense, I envisioned customers sitting down at the bar and asking “what’s in the Dispensary today?”. Far fetched as it may be, the Dispensary Series™ has no doubt been a passion project for us and continues to be one of our top selling beers in our tasting room. We’ve been offering them as draft only for the past couple years and this year decided to make the leap to cans, albeit on a limited basis. This is also our first foray into labeling cans rather than buying them pre-printed. This allows us much more flexibility in that we don’t have to commit to hundreds of thousands of pre-printed cans. You can find the limited release of our Dispensary Pale and Dispensary IPA in stores now! And, yet again, the TTB took issue with these labels while the TABC found them perfectly fit for sale in the Lone Star State. Apparently, the feds viewed the use of Dispensary on a beer label as misleading to customers by claiming a “therapeutic” benefit. Unfortunately, this one has been a bit harder to negotiate with the TTB. I’ve had 3 phone calls now with the label reviewer and each of them felt like I was being scolded by my grandmother. The green cross on the label may have been the nail in the coffin and my attempt at clarifying that the cross was not a reference to any medical benefit but rather a necessary design component to “tie the label together.” This particular reviewer also asked for clarification on the use of the word “heady.” Anywho, we’re still arguing this one, so at the moment it will only be available in Texas. Below are the two Dispensary Series™ labels that are out in markets now. This, again, was not part of the intended story line, but it has brought a 100% success rate in getting a laugh from every person I’ve described this debacle to. The life of a brewery owner is never boring — it’s insanely stressful and oftentimes complicated. But, finding humor in situations like these seems to mask the stress for at least a few moments. In the end, we’re just making beer. In some ways, I understand the importance of scrutiny when it comes to label approvals. Do I agree with the TTB’s rejection of these particular labels? Not at all. To their credit, they’ve given me one last opportunity to get the Dispensary Series™ labels federally approved. They’ve asked me to “explain Dispensary and the graphics used on the label.” Apparently, my previous attempts were not satisfactory. This should indeed be a fun exercise. Onward and upward — it’s the only way we know!